Inspiring Ideas with artist Jeanne Winters: Party with other Women Bloggers! Party with other Women Bloggers! 5 Minutes For Mom is having the "Ultimate Blog Party" this week! It is a lot of fun - a neat way to get to know your online "neighbors!" So many great blogs to check out and loads of wonderful prizes! For those of you coming from the pah-tay, here's a bit about me: I live in the sunny southwest. I'm married with 2 toddlers. 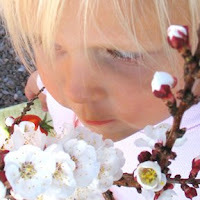 (This is my beautiful daughter smelling our apricot tree blossoms. Mmmm!) My first book was published in 2005. Inspirational Home: simple ideas for uplifting decor and craft was really an extension of my website, where I sold Christian gifts and home decor and showcased all my Creative Ideas, which were gifts and home accents you could make yourself. I just recently sold the retail portion of Creative Faith Place in order to be able to focus my time just on my art (painting) and design (new products.) I just recently started this blog so I could continue to offer my creative ideas that I hope will inspire others. I hope you stay a moment and peek at my other posts! I have so much more on the way! Thanks for stopping by! What a gorgeous photo! Welcome to the blog party! There are so many blogs to visit & friends to meet. What a pleasure!